Are bad working conditions causing deaths? A serious shortage of registered nurses (RNs) is forcing thousands of U.S. hospitals to function with skeleton crews, possibly causing hundreds of unnecessary deaths and injuries. 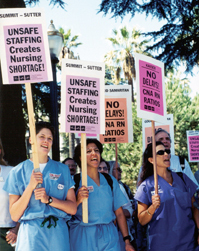 Many nurses are simply getting old and retiring, but many experts blame the shortage on low pay, poor working conditions and low enrollments in nursing schools. Meanwhile short-staffed hospitals are taking controversial steps such as offering large signing bonuses and recruiting nurses from overseas. Nationwide, there was a shortage in 2001 of 126,000 full-time RNs, but the shortage will surge to 808,000 by 2020 if something isn't done. Even more worrisome, many disaster experts say last year's terrorist attacks dramatized the possibility that a chemical, biological or nuclear attack could overwhelm the nation's nursing work force.